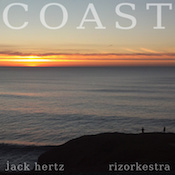 Calm and beautiful electro-acoustic music is standing by to massage your temples and soothe your soul on COAST from Jack Hertz and rizorkestra. The setup is pretty simple: guitar, vibes, voice, and electronics. Well, that and a heaping dose of laid-back California attitude. Through three mid-length tracks and one deep, 33-minute cut, Hertz and rizorkestra (may I call you Riz?) give off the feel of two guys just quietly finding their way along, riding with and building off each other, letting the sound guide the sound from one shape to the next. Riz’s guitar playing threads through everything, showing up as speedy little runs, classical-flair burst, and the crisp ping of well-placed harmonics. All the while sounding like he’s just playfully noodling, the notes just floating out of him onto the strings like a reflex. On “Low Tone,” his vibraphone work is packed with jazz influences as he glissando’s his way up and down the scale. Chanting vocals, wordless yet emotional, add an earthy tone that comes up just short of prayer. And let us not overlook Hertz’s side of the equation; his ambient backdrops run soft and deep, the passive answer to Riz’s comparatively dynamic role. In moments when the guitar or vibes pause to take a breath, the beauty of Hertz’s synth work bobs briefly to the surface. This is a true sharing of musical space, a vital and perfect chemistry that goes to work on the listener from the first note. The long track, “Fog Raiser,” is worth the download alone. The main flow is fully immersive, and Riz’s jazzy runs come like sudden bursts of excitement and discovery. The fact that you can hear the muted tap of fingers on fretboard makes it very personal. Around the 20-minute mark things gets quite vivacious, a very cool departure from the rest of the album’s more settled-in tone. Sequencer-like notes launch off into an orbit around your head and the guitar takes on a mandolin-like quality, that hummingbird’s wing strumming—and then it just as suddenly quiets back down. I can’t get enough of Riz’s playing here. If there’s a part of the guitar he’s not using, I’m not hearing it. His control over the dynamics of playing is impeccable. It’s a very pleasant sensation to have Hertz’s keys keeping my breathing low and slow as Riz’s guitar buzzes ticklishly in my ears and head and pings my inner jazz lover over and over. A stunning album that you must have.